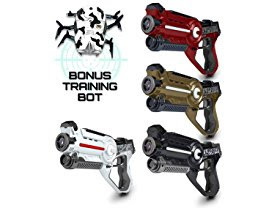 Hurry over to Woot.com where today only this Force1 4-Player Space Blaster Laser Tag withTraining Bot is just $69.99 (Reg. $149.99)! Shipping is FREE for Amazon Prime Members or only $5 flat rate. FORGET THE VEST & FIGHT WITH THE BEST. Blast your way to laser tag victory by aiming at your opponent's laser tag gun. These laser tag sets don't need vests – all you need is your trusty Blaster and space-ninja reflexes.